Download the study (pdf) here. First things first, a huge and generous thanks to everybody in Prof. Nisha Botchwey’s class at the University of Virginia School of Architecture for their efforts, and the results of said efforts. By their producing the report from which my interpretation is derived, they have done a tremendous service to the local community. Second, theirs is a comprehensive report and the snippets I am going to highlight are not representative of the significant amount of work that they put in. Third – and perhaps most importantly, this is the first time (that I am aware of) that this data has been pulled together in such a manner that we are able to get an accurate picture of the current state of foreclosures in the City of Charlottesville. What does this all mean from a market standpoint? Foreclosure activity is likely to increase, but we are nowhere near the foreclosure rates and percentages of the major foreclosure hotspots – parts of Florida, Phoenix, California – which account for a majority of national foreclosures. My analysis is focused more on the data – location of foreclosed homes, market trends, prospect for more foreclosures than on the impact on the community and what the government can do (I don’t necessarily trust government as an efficient or effective vehicle of positive change). 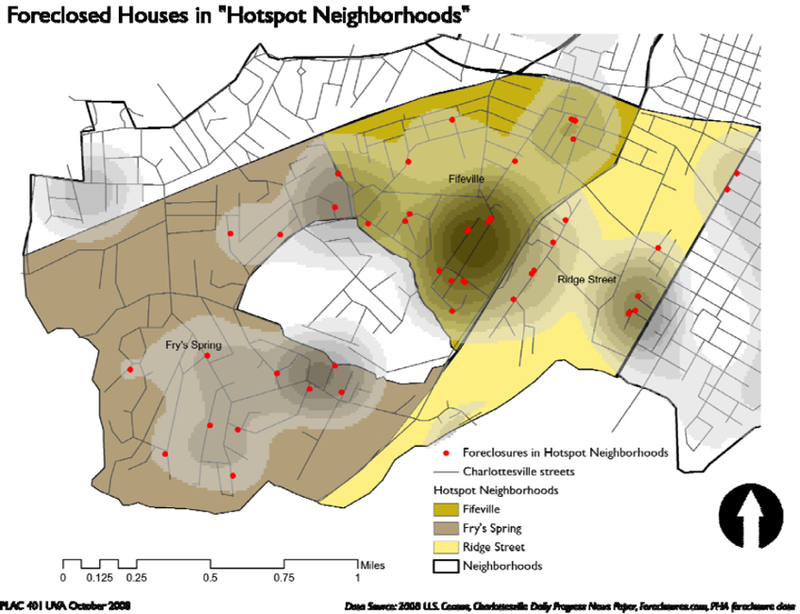 While their focus seems to conclude that the lower income level neighborhoods have shown the most foreclosures, my gut tells me (no, that’s not quantifiable) that foreclosures next year are going to spread in Charlottesville from the lower income areas to moderate and high income neighborhoods. If you’re looking to buy a foreclosure, why wouldn’t you? (You can search the foreclosures listed in the Charlottesville MLS here – although part of the data problem is that many foreclosures are never listed in the MLS) Especially when rates are at historic lows – you could buy, hold for twenty years and most likely do very, very well for yourself. Not to mention that if you aren’t a slumlord, you could have a positive influence on the surrounding community. From my position as a Buyer-Broker, my advice to my buyers would be – be well qualified and prepared to buy and consider targeting these neighborhoods; they are all very well located with great respective proximities to the University of Virginia Grounds and/or the Downtown Mall – the two major economic hubs of Charlottesville. Reifenberger said the students -Â€Â™ data showed several areas in Charlottesville have been more affected than others by foreclosures. The most affected areas included Fifeville, Star Hill, Belmont, Ridge Street and the area around 10th Street and Page Street, Botchwey said. The number of foreclosures in Charlottesville and Albemarle County spiked in February 2008 at 35, Botchwey said, and since then has seemed to decrease and then level off, with 12 foreclosuresin September 2008. Reifenberger noted that the spike may have been caused by inappropriate loan procedures and declining house values. Quite honestly, this is the sort of data aggregation and analysis I would like to have seen from a Realtors’ group … maybe going forward we can be part of this. The second theme of correlating blight and prevention, fourth-year Architecture student Alicia Rabadan said, deals with the issue of preventing decaying properties from negatively affecting their surroundings. Rabadan explained that the motivation for this part of the project was a perception that -Â€Âœblighted -Â€Â properties not only damage aesthetics but also encourage further deterioration of and damage to property in the surrounding area. This in turn may lead to less community development, more crime and other issues that would reduce the quality of life in affected neighborhoods, Rabadan said. Not to get off the topic of the importance of community building and preservation, but take note of the Broken Window theory and the debate between the Freakonomics authors and Malcolm Gladwell. Bridger pointed out that 31.4 percent of adjustable-rate mortgages in Virginia are scheduled to have their rates reset in the next 12 months, increasing the possibility that struggling homeowners will fall behind and default on mortgage payments. -We expect we’ll see more foreclosures in Charlottesville in the next year, – she said. This number indicates at least two things – 1) Opportunity for Buyers and 2) Pain for homeowners/sellers and perhaps their neighbors. Going forward – there are going to be conversations about updating this data throughout the year. As always, I’ll write about events and progress here. Ideally, I’d love to see this type of analysis for more than the City of Charlottesville, including Albemarle County and the other localities within the Charlottesville Metropolitan Statistical Area. After collecting this data, students created a GIS database file of all the foreclosures over the selected time period in the area. In teams students analyzed demographic and economic factors, the spread of the foreclosures over time, and the effects of foreclosure on neighborhoods and housing stock. One note on this graph (which I noted earlier this year with equal fear) – if the rates reset downward, the fear, while justified, is lessened. The Center for Responsible Lending predicted that 62,174 homes will be foreclosed upon in 2008 and 2009 in the state of Virginia.38 In June 2008, according to the Mortgage Bankers Association, for the foreclosures in the state of Virginia, 54% of them are on subprime and Alt-A loans -non-traditional – loans while 26% of the foreclosures are on prime and government ARMs and the remaining 20% are on government and prime fixed rate loans.39 In other words, approximately 80% of the foreclosures in Virginia are by higher risk borrowers -subprime lenders and/or ARMs. And finally, this from HotPads – which admittedly might not have the most accurate data, but it’s likely good enough to put the Charlottesville foreclosure rate in perspective. The real estate market can be divided into three groups of sellers; those that want to sell, those that need to sell and those that have to sell. As market conditions continue to deteriorate the need to sells become have to sells and the want to sells withdraw. What we are left with then is a market with no bottom. Just how the same government geniuses that got us into this mess plan to get us out will be very interesting to observe. We are in store for a lot of thrashing and screaming about the housing/mortgage mess this year from the folks in Washington DC. It is becoming increasingly clear that the Obama crew has no clue as to how to solve the problems and so far there is every indication that their solutions will be like swinging at shadows. The real danger here is that they will end up punching a tar baby and the unintended consequences of their attempts to cure the crisis will end up making things worse. In my mind the problem is a simple supply demand imbalance and until we do something to return to some semblance of parody and create consumer confidence, building a floor in these markets will be impossible. And loaning the middle class a couple of hundred or even a couple of thousand dollars through a tax refund will do little or nothing to encourage people to go out and buy a home or even a car for that matter. As the sun sets on the housing market here in S.W. Florida the shadows of foreclosure grows ever larger. The number of homes that will ultimately be dumped on this market is staggering. As it stands now Lee County leads the nation in foreclosures and every day dozens of people simply â€œwalk awayâ€ from their obligations. That’s not to say they are leaving town, quite to the contrary, they are staying put waiting out the required action by the local court that would put them out on the street. In fact there are web sites like Walkaway.com that offer to aid and abet the scofflaws that want to defraud their lender by suggesting strategies that will allow them to live rent free for up to 2 years while they fend off their lender’s attempts to make them pay up. The simple solution is for HUD to take a page out of the Department of Agriculture playbook and provide price support by warehousing surplus housing in order to create a market floor. However, with the promised coming â€œchangeâ€ the problem then will be for communities across the nation just who the people administrating the New Obama Nation will choose to move into these government owned houses. I believe it. We have the last two administrations to thank for the social engineering that forced the gov’t to guarantee loans for people who have no business owning a home. Clinton and the Democrats turned home ownership into a Constitutional right in the 1990s, and Bush and the GOP did nothing to stop it, turning “homeownership” rates into a metric to demonstrate economic success. In the meantime, house prices doubled and priced out a lot of people. Many of the priced out turned to too-good-to-be-true loans. As this relates to poor people in C-ville, poor and less educated are more likely to go for interest-only type loans. But we have our government to thank for the fact that they were able to get loans in the first place. The government, human greed, and the death of personal responsibility. These numbers from this report track pretty well against the list I’ve compiled, though they show a few more than I have – I’m going to try to figure out where that discrepancy comes from. Mark – much as you and the GOP want to try to spin the blame for this mess away from the total lack of regulation of the RMBS market and the CDSes need to insure that market, courtesy of the GOP ideology of deregulation, and place it on anti-redlining legislation, that’s not the truth. 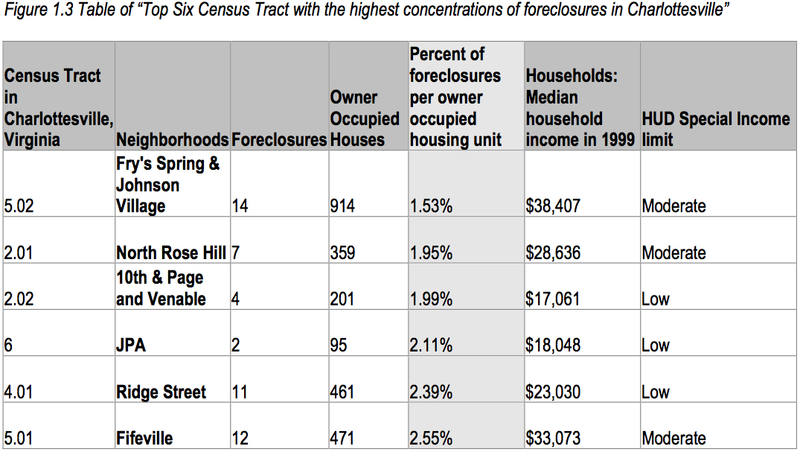 And the fact that foreclosures in our area are just as heavily represented among the wealthy as they are among the ‘subprime’. The study focuses on the low income neighborhoods, but the data I’ve collected on trustee’s sales show that just as much of this is going on in ‘wealthy’ areas – Western Albemarle, for example. 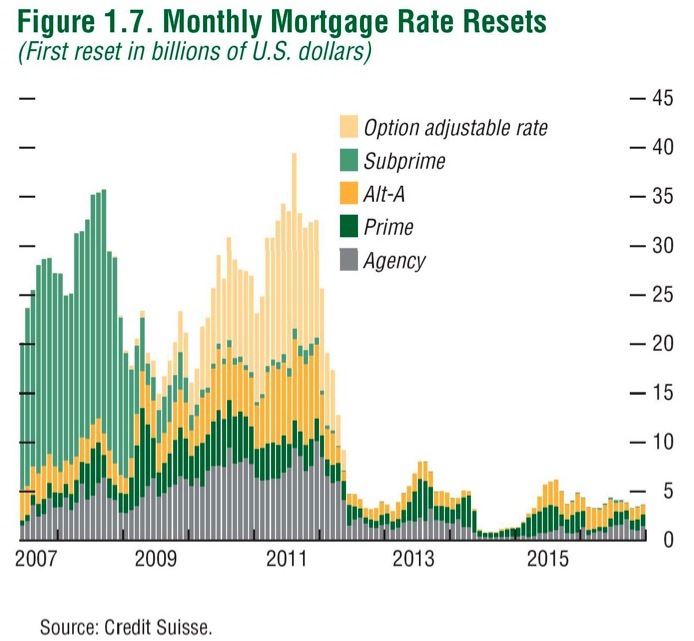 Secondly, just wait until that second wave of resets hits – the “Alt A” which is essentially subprime for “sophisticated” borrowers with good credit scores. Try again. This is NOT the result of social engineering – it’s the result of a credit bubble enabled by unregulated credit markets (that would be “the smartest guys in the room” and the “masters of the universe” on Wall Street). Clinton and Rubin were complicit, but they were following the Reagan doctrine. Oh, ok, well, if you say so. Try and post “The data I’ve collected” somewhere and you might convince me that foreclosures are not largely confined to poor and poorly educated. As for social engineering, to deny it is a major cause just belies your ideology. I am willing to accept that a lack of regulation also played a large part, but when a lower-income family on my street got foreclosed last month for a relatively low $200k debt, I’m gonna trust my eyes more than “The data I’ve collected.” Post it. Back up your words. I will take you up on that challenge – I’ll clean things up a bit and pass it along to Jim – he can post them or leave them here in the comments. I think you’re the one with ideological blinders – social engineering has given us a lot of problems – here in c’ville: Vinegar Hill, Friendship Square, Westhaven, and the associated problems of high-density poverty, but the housing bubble is not one of them. The anti-redlining stuff was on the books for over a decade before the bubble really got underway – of course, in those days, the only big secondary market for that funding was the Fed: FNME, FRE, who where…wait for it…at least somewhat regulated – they made loans to marginal borrowers, but had to actually verify employment and assets, no NINA loans allowed. The party didn’t get out of control until LEH, BSC, JPM, MS, MER and UBS got in on the action and started pumping this stuff out hand over fist, completely without regulation. Think for yourself, don’t let the right-wing noise-machine do it for you. Numbers forthcoming…my favorites are the experts in housing values – Realtor flippers like Doug McGowan and mortgage brokers like Chris Prang – the financially sophisticated and responsible people – not that low-rent riff raff who never should have been able to buy their own place! I’m game for this, and thank both of you for your thoughtful comments and time.